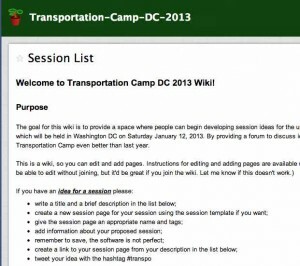 I just created a wiki that people can use to develop session proposals for the Transportation Camp DC 2013. It’s totally unofficial but I hope it can provide a place for people to share ideas and therefore help develop better proposals. There’s a figure showing the “Transportation Camp DC 2013 Session Wiki” on the left. I also developed a linked page called “Social Networks and Transport” for a session I proposed that discusses how social networks can be used to improve transport planning and operations. The wiki has been taken off line (October 2014) but if you are interested you can contact me. Finally, I should mention that the previous Transportation Camps have been great and I am sure DC 2013 will be no exception … get your tickets soon!